All WordPress based sites need routine maintenance to keep them running well. This includes optimizing their performance, regular backups, upgrades, and keeping them safe from Malware and hacks. Given the incredible popularity of WordPress and it’s associated themes and plugins, WordPress is often a main target for hackers. Failing to keep your site current and protected can result in your site be riddled with spam, resulting in negative impact to your brand. Even worse, a hack can result in your site being down, often for long periods of time, resulting in loss of revenue and a negative impact to brand. Backing up both your content AND your site files, like themes. As a website owner, business owner and content creator, we know you don’t have the time or desire to deal with this kind of stuff. We understand that you should be focusing on building your business, not side tracked by technical details that cost you money, instead of earning it. That is exactly why we created two different blog maintenance programs for you: Platinum and Basic. We take care of those time consuming maintenance tasks for you, all for a low monthly fee. Our most cost effective AND comprehensive plan. Designed for professional bloggers, business owners and internet entrepreneurs. Unlimited email question/answer support – Actual work requests would be at an additional cost. Our most basic and low cost plan. Designed for new and casual bloggers and website owners. 1 hour of email question/answer support – Actual work requests would be at an additional cost. Fill out the form below to sign-up! But Wow….that’s expensive. I can’t afford that! How much time do you spend each month doing these necessary maintenance items on your blog? Maybe you aren’t doing them like you should, so How much time SHOULD you spend each month doing these necessary? I know for many of my clients, if they spent the time they should keeping their blogs up to date, they would spend in excess of 8 – 10 hours a month! On the opposite end, I have clients that don’t do the maintenance they need, and frankly their sites are a ticking time bomb, just waiting to be hacked, infected with malware, or even worse having an outage or issue that causes weeks or months worth of content to be lost. All of these are risks to your business, and things that can directly affect your income and online reputation. Do you know your hourly rate? If you spent a whole hour doing something that would generate your income, how much could you earn from that hour? Not sure? Take how much money you earned last month and divide it by the time you spent doing things that directly created revenue. Don’t include all the things (like blog maintenance) that aren’t directly related to earning money. Generally you’ll find that number to be between $25 – $75/hour. If you’re doing consulting or services work, it could be much more! I know some SEO consultants that charge $125/hour. Let’s assume you spend a moderate 5 hours on average per month doing blog maintenance activities that don’t directly earn you money. Let’s also use a conservative $25/hour rate. If you spent those same 5 hours doing something that earned you money, that is $125.00 in your pocket. Hey, wait a second…That’s $50 more than the Platinum Blog Maintenance plan. Hmmm, maybe you can afford it after all. While these numbers vary from person to person and site to site, the point we’re making here is: Focus on your business, let us focus on the technical details. Not only will you not need to worry about it, you can sleep well at night knowing we’re taking care of it AND doing it right. 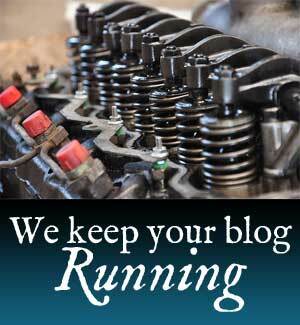 Sign-up for our Platinum or Basic blog Maintenance Plan today. Just fill out the contact form, and we’ll follow-up within 24 hours to get you started.